I always enjoy seeing another gal working there. Not secretaries—most of the time, I can’t even get a key to the ladies’ job Johnny out of them. But now and again, there’s another woman getting her hands dirty, although rarely as dirty as mine. Usually, they’re inspectors or heavy equipment drivers, although I worked alongside an electrician once. We exchange relieved nods as we pass. It’s a very small sisterhood. For the moment, we aren’t alone. Nothing to prove. I expect to have to work harder and much smarter to gain the respect of the men around me on a jobsite. On top of that, there’s dealing with the expressions of other women, those who have jobs where they stay clean. I know I look bad when I see a gal check her appearance in a mirror or window and give herself a satisfied nod. Mostly, our company waterproofs, but now and again my husband takes a job that requires acid and pressure washing. These are usually historical restoration gigs, returning brick, marble, and tile to their original pristine glory. Completing one of these is incredibly satisfying. We start with an old, unloved building, and by the time we’re finished, it’s something special again. The other reason I’m glad to be done is because pressure washing is one of the dirtiest things we do. When you spray water onto a hard surface at thousands of pounds per square inch, it doesn’t just trickle down the sides. It bounces back all over you—along with all the dirt, moss, and other unnamed substances it’s best not to think about too much. By the end of the day, I feel like a slime monster. The courthouse in Chico was restoration as usual. I had cleaned my way to the upper balcony, and those were always extra work. But when I climbed over the stone railing, this time there were two pigeons huddled in a corner. One was mixed brown and gray, the other was mostly white. They crouched next to the dirty brick wall, awaiting whatever fate I saw fit to dish out. What if they’d gotten nailed by the acid overspray? Hydrofluoric acid stings, even diluted. I didn’t even want to think about what it could do to their eyes. I climbed down the scaffolding to get a bottle of water. But even after I doused them both, they still wouldn’t fly. They just shrank up next to each other, silent. They were either unimpressed with my cooing or traumatized. And if any guy caught me cooing to pigeons, my jobsite credibility would be toast. I stood there, thinking. We needed to get the balcony done today. The pigeons wouldn’t or couldn’t fly, and there was no way I could squirt them with acid. Maybe I could carry them out of harm’s way. There had been some empty boxes in the bare entryway—the debris of supply delivery. They’d come in handy now. I got the birds in the box and made it down the scaffolding again with it—which is far more difficult than it sounds—when my husband Tom reappeared. I got them a blueberry scone and found a styrofoam bowl for water. Then I checked around. No one was watching. “Don’t worry—I’ll look after you.” I cooed at them in farewell. But when I called around, it appeared that was the problem. Pigeons are everywhere. Nobody was particularly interested in saving them. That left me. At least nobody had found out about it yet except Tom. And he hadn’t ratted me out to anyone else. John, one of our employees, joined us to talk about the day’s progress. I nervously listened for sounds of pigeons from the truck, but they were silent through the end-of-day chit chat. 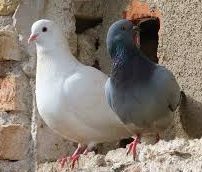 “Fine, but wait until Frick and Frack are asleep.” If I was going to be a pigeon mother, I would at least try to be a good one. A point. Still, I was going to chance it. I’d taken their home—they could share mine for now. The pigeons didn’t coo, and incredibly, they stayed in the box all night. “See, they’re working out just fine,” I told my husband smugly the next morning. He just shook his head. The spring day was no more than warm, but I left the windows down for Frick and Frack anyway. I checked on them every time I came down to terra firma. They didn’t seem terrified—they moved around their box freely—and they’d nibbled their scone. I was willing to call it provisional success. But before the end of the day my unusual activity was noted. “Why are you going to the truck so often, Cathleen?” John asked. Tom started laughing and I sighed. Wait for it. I shook my head. “No, pigeons are much nicer. We had a couple pet rats once, and one of them killed the other. These two love each other.” I scurried across the street to get them another scone to the sound of male laughter. Ah, well. My slime monster makeover and acid-laden working conditions at least meant I wasn’t pestered with general conversation while I was working. Breaks were another story. I turned. I barely knew this smirking guy—word had gotten out fast. “Very well,” I said, aiming for a lofty tone. I looked up for strength, although with my luck I’d find another wayward pigeon. He laughed as I stalked away. Fine. Tom could attend all the jobsite meetings here. I hated meetings anyway. But Frick and Frack merely gazed up at me. Probably just as well. The last thing I needed was issues with the motel. This job still had another week to run. Frick led the way, head bobbing as he explored the fabulous restored masonry. Frack followed, although she was far more interested in the scone than her surroundings. I stroked their backs in farewell and hopped over the railing to climb down again. As I took the first rung, I heard the sound of pigeons cooing. ‹ Why Readers Stop Reading a Book. Awww, that was just great. I had a terrible day today and your story picked me right up. If you get a chance, please post at the Salon on Wednesday. Cathleen, I love this story! Is it true? Must be, as the words were from the heart, not from the mind. Thank you! jlfatgs, I hope my fiction makes people feel the same way, but this was a memoir. I really took in Frick and Frack. The most amazing part of the whole thing to me was the way they stayed in their box. Bette, sometimes I wonder if Frick and Frack could have grand-pigeons by now and bore them with stories of how they were saved once by a giant. I’m glad the memoirs are working out because I attended this webinar, and the gal running it had impressive credentials and really sounded like she knew what she was talking about. Anyway, she recommended a press kit section attached to your About Me, the reason being that if you want to get interviewed or featured in any way by mainstream press, the best way to make that happen (other than to write a good book) is to make it as easy as possible because everyone is short on time. This sounded so sensible that I’m trying to follow through on it. And one of the parts of the press kit is five fun facts about you. I figured I’d list them and attach a memoir to each one. What a nice feel-good story – thanks for sharing that (and for taking care of them). Cathleen, this is a charming story, so fresh and original. So pleased that it’s a memoir. You’re a true Jill of all trades. Thanks for the info about the Press Kit – I would never have thought of that but it’s a great idea. Happy to pass it on, Sharon. I’m just making my first efforts in that direction. Some of it’s a pain, like having bios that are three different lengths, but I figure as long as I keep working at it, it’ll get done. I love, love this story, Cathleen. So sweet and compassionate. A pigeon mommy 🙂 Loved it! Love this. How terrific of you to share the story. I hear you: I know…. Thanks for posting at the Salon. You know how I feel about this story – love it. Super happy to have your talent. Yeah! Pigeons cooing away safe and sound. Great rescue and love the story. Welcome on board! Cathleen, Thank you so much for following my blog.Your following is an honour. Great story, the animal angle always gets me.